A sense of place is very important in this first book of poetry which won the 2000 Naomi Long Madgett Poetry Award. Wemple writes from that vast space on the map between Pittsburgh and Philadelphia, a region of forests, coal mines, farms, and small towns. We are introduced to individuals who inhabit the area and visit the places that they frequent. They are products of their unique environments, and Wemple brings them vividly to life. The author makes even the bars and bigots sing. Other poems include more of the state and the nation as in the poem, "Half a Mile Off Everglades City, Florida." 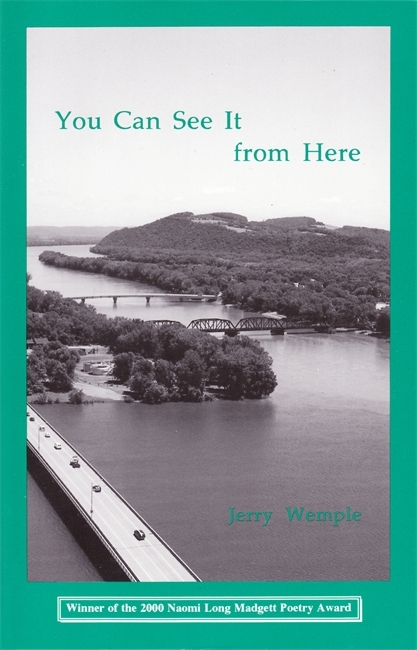 Jerry Wemple grew up in central Pennsylvania and southwestern Florida. He earned his B.A. from Vermont College and an MFA from the University of Massachusetts-Amherst. He served in the United States Navy and later worked as a newspaper reporter in Massachusetts. He is currently a Professor of English and Creative Writing at Bloomsburg University.